1. vi to make or live in a nest 2. vi to make a place more comfortable or homelike (informal). 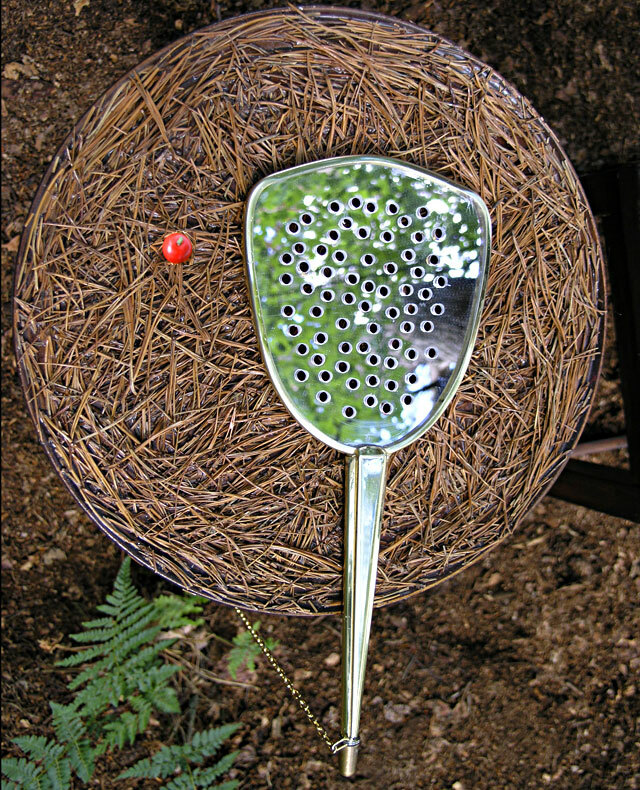 Inspired by a beautiful woodland setting Allison and Bray’s new work is based on a theme of ‘nesting’. 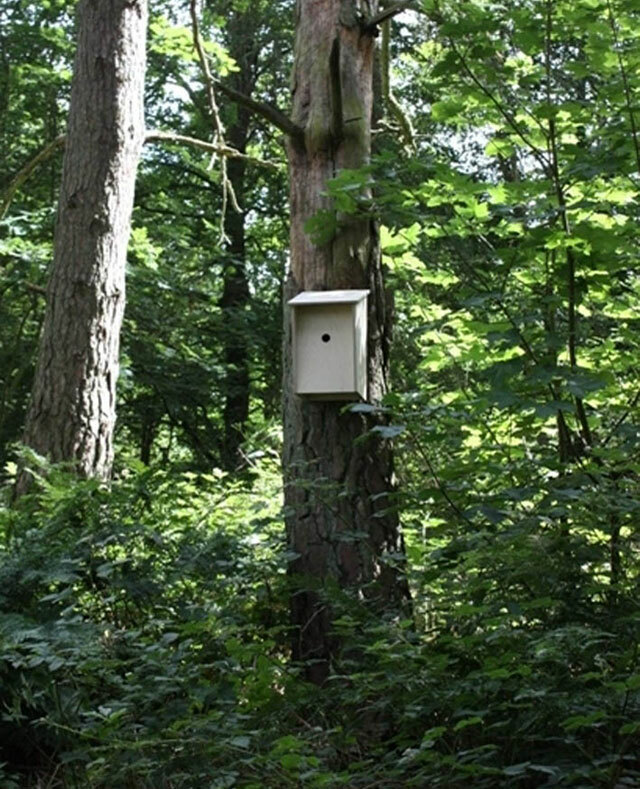 Three short films, shown inside bird’s nest boxes, explore three unique spaces. These spaces, all made by men, are intimate, quirky and highly personal, revealing the creativity of their owners.The viewer is invited to have a bird’s eye view of these spaces, looking through the entrance to the nest box – a private engagement, giving a sense of inclusion. The artists would like to thank the individuals involved for giving them the opportunity to film in these extraordinary places. Elaine Allison and Patricia Bray have been working collaboratively since 2002, on site specific installations, international residencies and community art projects. They met at Duncan of Jordanstone Art College in Dundee. Made from thousands of dried teasel heads, the installation is inspired by research into the lives of the Cistercian Monks of Coupar Angus Abbey. Indeed, ‘Cistercian Links’ has been erected at Heartwood, on land which is believed to have been part of the Abbey estates. For centuries, teasels were commonly used in the finishing process of cloth making. In Medieval Times, the Cistercian Order was known to have developed this process so successfully that they were recognised as being the instigators of a minor “industrial revolution”. Known as the White Monks, they were the only order to wear white habits. 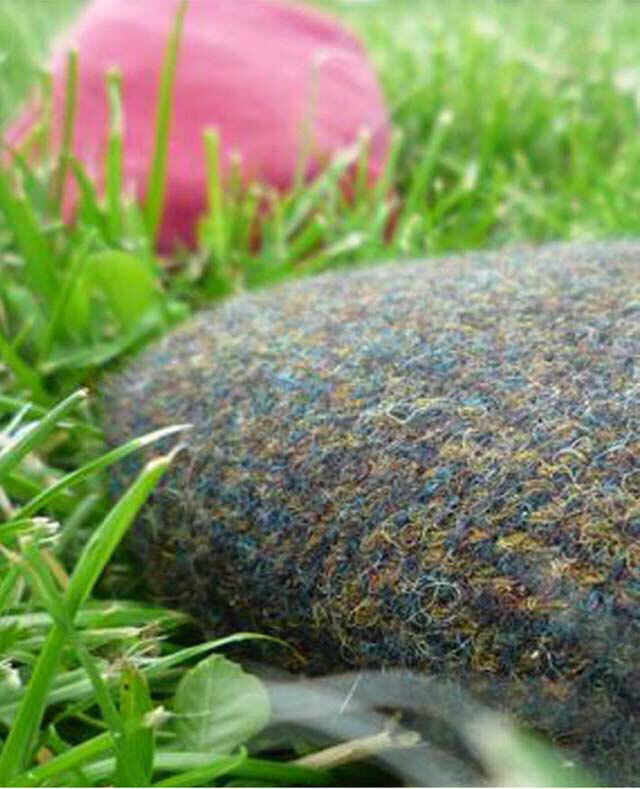 These were usually made of wool from the sheep that grazed on their extensive lands. The teasel heads used in this installation have been coloured white to echo this fact. An additional feature of the installation is movement. Since the teasel heads are light in weight, the gentlest of breezes causes a pleasing movement which catches the eye of the viewer. Quietly placed under the rowans, “Gathering Dishes”, suggests these woods have at some point been populated by beings whose purpose is not clear to us. Are these dishes here as part of a scientific experiment, collecting biological specimens, or maybe they will gather the fruits of the rowans against the thin days of winter? Perhaps they are waiting for a message from far away – or simply recording the passing flickering of light and shade that plays across their surfaces like images on a retina? The regular form of the dishes indicates some sort of intention, but the natural irregularity of their colouring suggests poetic rather than scientific meaning. Their warm presence here seems to suggest a benign absence. Perhaps after all they are simply the remains of a sociable picnic under the trees. 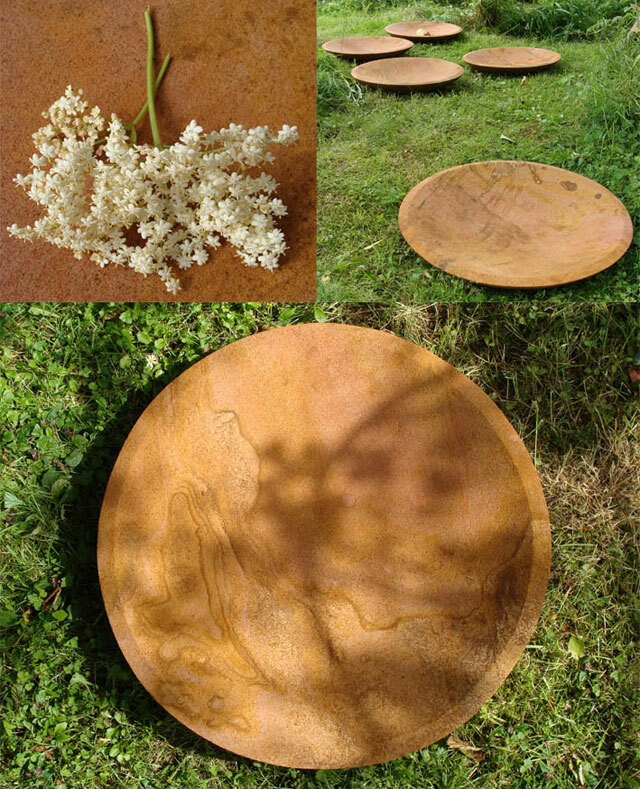 Mary Bourne is a sculptor who works predominantly in natural stone. The intrinsic qualities of this stone are an integral part of her work and a sense of geological timescale is often an underlying theme, a sense that there is a bigger picture than this constantly vanishing present. Mary has undertaken numerous commissions for public places, has exhibited widely in Britain and abroad and has won a number of prizes and awards. She was a Trustee of the Scottish Sculpture Trust and Chair of the Scottish Sculpture Workshop during a period of artistic re-visioning and organisational change. She is currently on the Board of Deveron Arts and is working on a commission for Westhill, near Aberdeen. “….Not a flower in sight. Was it dying? Or was it just drowsy? It was early April 2010 in Monkquell woods. The butterflies were motionless on the branches. Normally, butterflies would have been busy among the wild flowers, but not a flower in sight, just trees and bare branches. Everything still seemed to be in winter mode. The winter had been prolonged and severe. 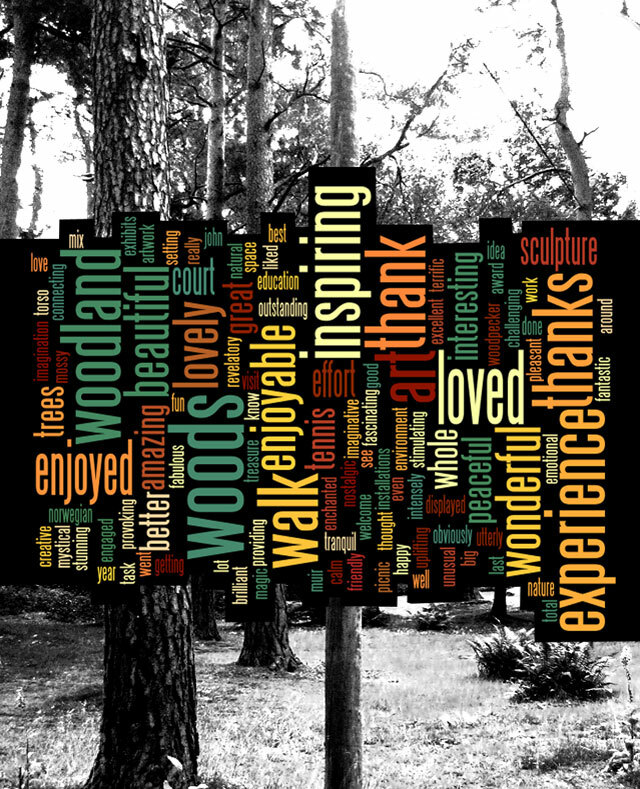 The installation in the rowan grove reflects these observations with a series of questions and a poetic rendering of ideas. Delicate porcelain butterflies are camouflaged on the rowan branches. Their wings are uneven, like the misshapen insects affected by radiation by artist Hesse-Honegger. The white porcelain surface is scotched by fire. The wings are motionless. These fragile creatures compete with an enormous bronze butterfly weighed down by metal, reduced to its shiny veins. Was it dying? Why so lethargic? A graduate of Edinburgh College of Art, Fanny Lam Christie’s work explores our relationship with nature. 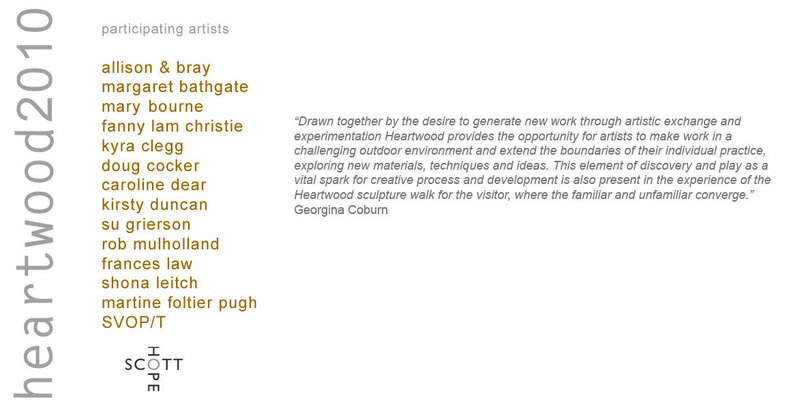 She has recently been awarded one of four public art commissions in West Lothian in 2010. In her project ‘Inspired by Zen’ she re-interprets the traditional zen garden and creates a contemporary zen garden with sculpture interventions and participation by the community in Armadale. Each of the pieces in Kyra Clegg’s ‘Looking Room’ is constructed around the motif of a search for our bearings in a wood. 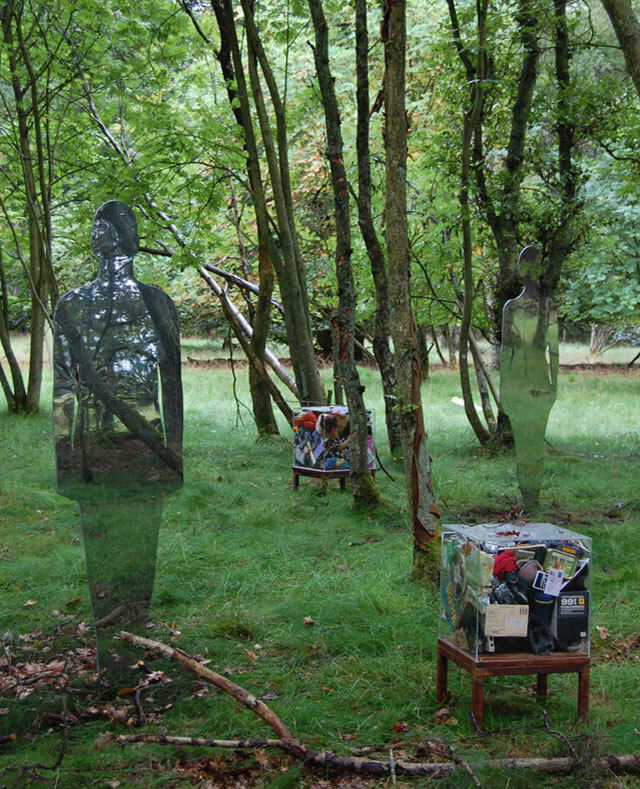 Furniture in the forest is surrounded by a semi-circle of trees. No walls enclose the room they are in. A bookcase, a table, a chair – all seem strange in this room without walls as if they (and we) are lost. Mirrored books reflect the wood while the objects they contain speak of a more interior way of looking. Fact or Fairytale? Scientific Analysis or Myth and Narrative? There are many ways of looking at our natural environment and our place within.Does the framed picture hanging on a tree – “JUST LOOKING – not lost” – reflect a sign of hope that we do know – or can know – exactly where we are?It’s all a matter of looking. A graduate BA in fine art Kyra Clegg’s work consists of mixed media installations incorporating sculpture, photography and video. Solo exhibitions have included work on the theme of habitations. More recently in 2010 she undertook a residency at Perth and Kinross Council Archives resulting in two solo exhibitions on the theme of personal and collective remembrance. Tools and Moons is a sculptural assemblage alluding to time and work. The tool elements follow the conventions of handle, shaft and blade but have no evident function. The other two forms adopt the crescent curves associated with the illusionary image of the moon. The central holding device is a ‘black box’ confirming that our ration of time and work is finite and also perhaps illusionary?” As Cocker tells us, Tools and Moons evokes the rhythm of nature, the arduous craft of those who work the soil and the passing of time. These enduring values are however confounded by a sense of dysfunction and interrupted tempo that is characteristic of his pointed social engagement and commentary. Doug Cocker was born in Perthshire and studied at Duncan of Jordanstone College of Art. His lecturing career took him to England and to Grays School of Art until he returned to Perthshire in the 1990s to practice his art full time. His repute reaches far, he has exhibited extensively in group and solo shows at home and abroad, has won numerous awards and public commissions and his works are held in national and international collections, both public and private. He works in wood or metal with great attention to craftsmanship, in monumental and domestic scale, around themes inspired by the natural and social landscape and often served with a good pinch of satirical wit. ‘Enclosed’ explores ways we perceive the environment around us. With a minimal veil of structure formed using willow our feeling of the space within the wood is transformed. We become conscious of a within and a without and the boundaries of this particular physical space can be defined. In making this defined enclosure the wood can now be viewed differently. Thoughts around the idea of sanctuary, secluding from the outside world, and of perspective and framing ones viewpoint lie within this piece. What makes us enclosed, our minds or the physical reality? How are our boundaries framed by tradition, by culture? 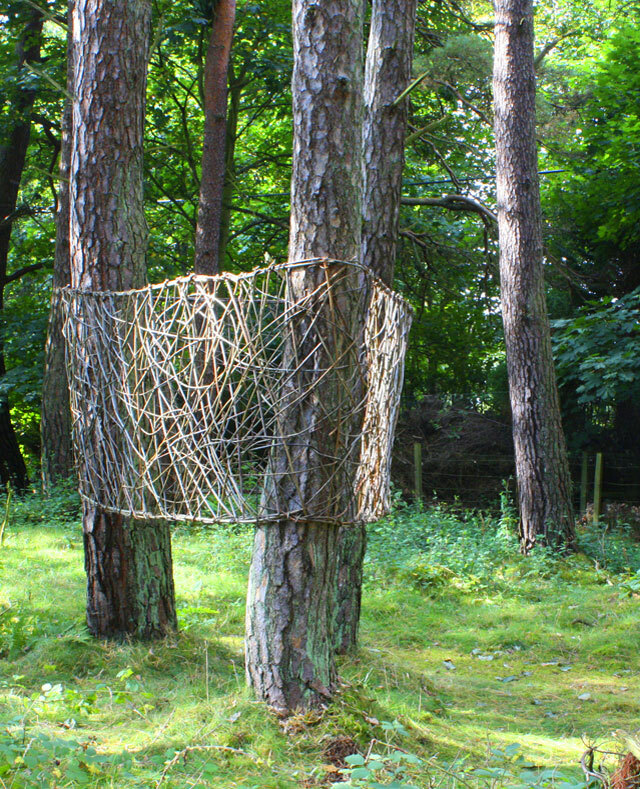 Caroline likes to make structures with natural materials such as willow, moss and heather, using the material to its structural limits to create the largest sculptural forms whilst using the minimum amount of material. Caroline Dear graduated in architecture in 1986 and worked both as an architect and a landscape architect. She has lived and worked on the Isle of Skye since then. She exhibits regularly both in Scotland and abroad. Commissions include site specific work for HIE and the Woodland Trust; exhibitions include creating one off pieces for 6 cities, Eden Court, An Tuireann and awards have included SAC research and development grant and Hi-arts grants. 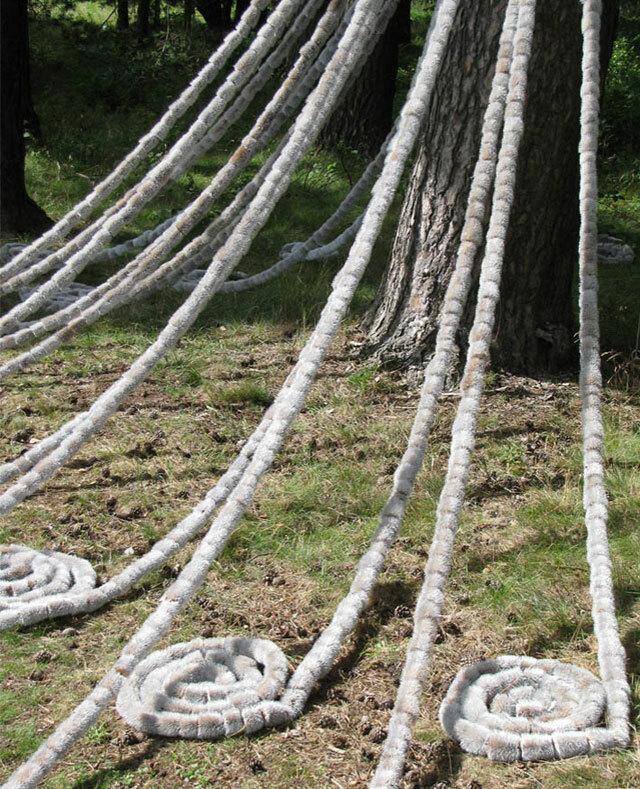 Most recently she has been an invited artist at Saari Manor in Finland exploring environmental art issues. Stories are told and retold. Some of the stories we hear as children eat their way into the core of our beings until we no longer remember the tales, but bits of them resonate and inform the way we interpret the world around us. Fairy stories that have been around for millennia are told and retold with different inferences to illustrate the dominant moral climate of the time. Kirsty Duncan is working with fragments of popular childhood fairy tales, playing with the symbolism and the ‘forgotten’ details, mixing them up and recreating a sense of a journey through a forgotten tale. The stories referenced at Heartwood have been retold by Clarrisa Pinkola Estes in her book ‘Women who run with the wolves’ They are reclaimed from a dominantly male telling with a wild woman emphasis. 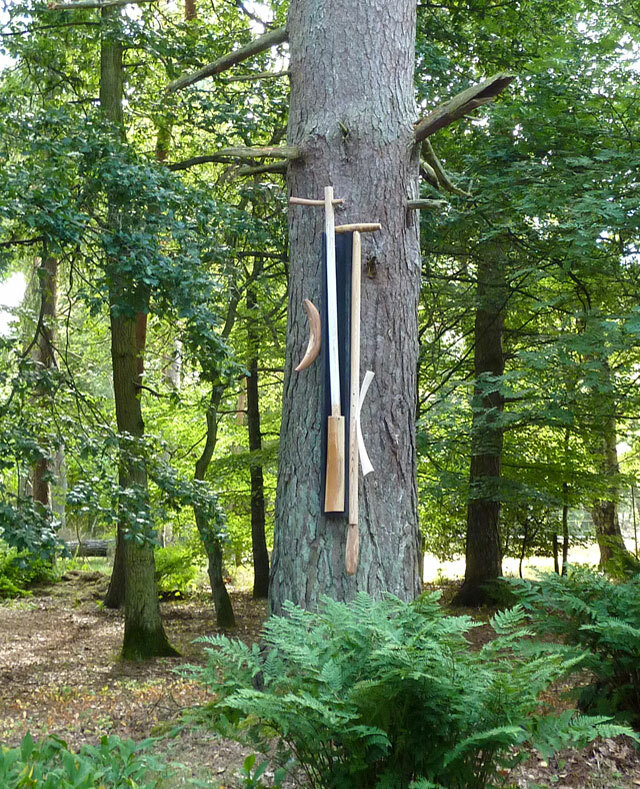 An invitation to make a piece for Heartwood represents an opportunity for Kirsty to make a site specific piece and develop this area of her work. 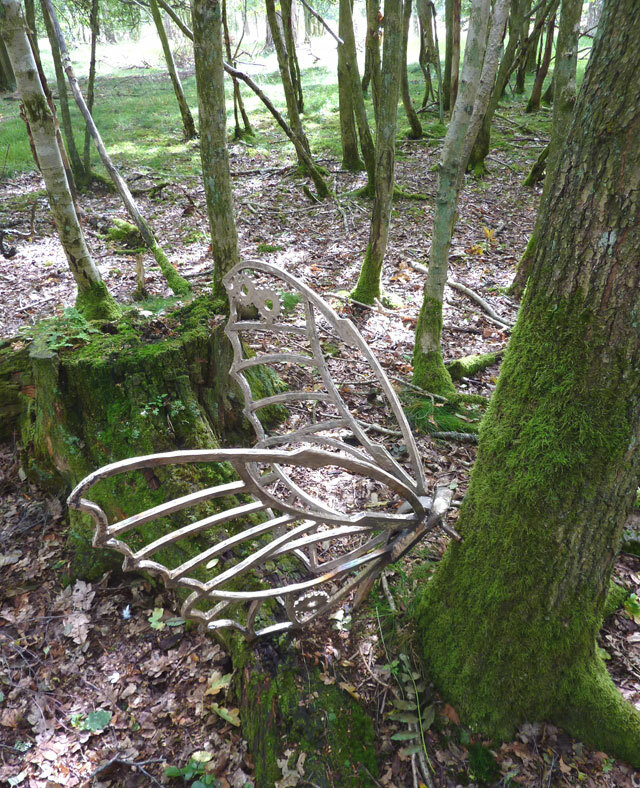 This work is the outcome of a forensic style investigation to find evidence of actions occurring in the Heartwood woodland that are normally unseen by the casual visitor. Objects showing evidence of these actions have been collected and are now displayed within a very dark space. The items can be re-discovered by the viewers using torches as they negotiate the space. Reflections and shadows create an atmosphere often associated with the darkness and partially seen nature of deep woodland where we share our world with unseen others. 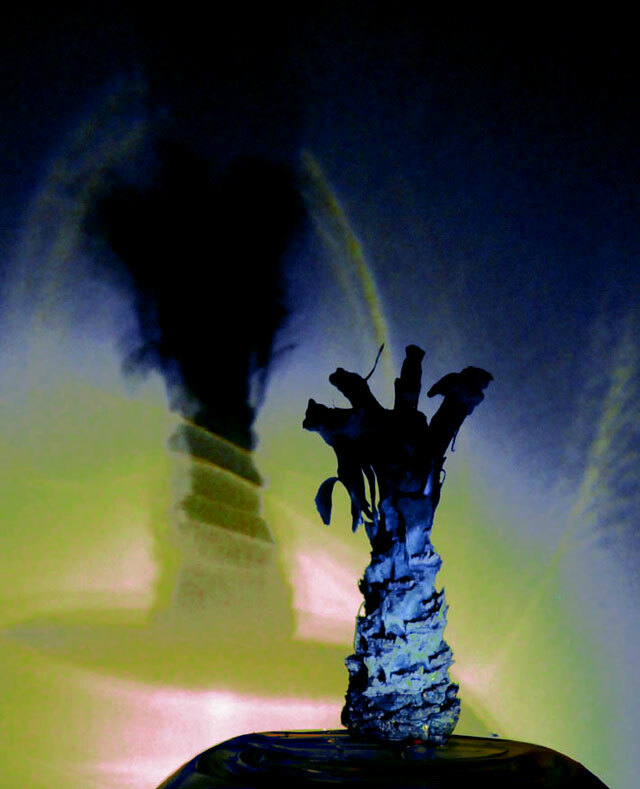 Su Grierson is an established Scottish artist working mainly with video, sound and photography. She trained at Duncan of Jordanstone in Dundee and Glasgow School of Art. She is Chair of Perthshire Visual Arts Forum. Living in rural Perthshire she exhibits regularly in Scotland and abroad and is committed to making contemporary art happen in rural locations. Inspired by the natural beauty of the Monkquell woods, ‘Shrine’ is a literal reaction to the idea of the sacredness and timelessness of place, past, present and future. A case housing a female figure resembles a wayside shrine, a universal symbol of worship or veneration? 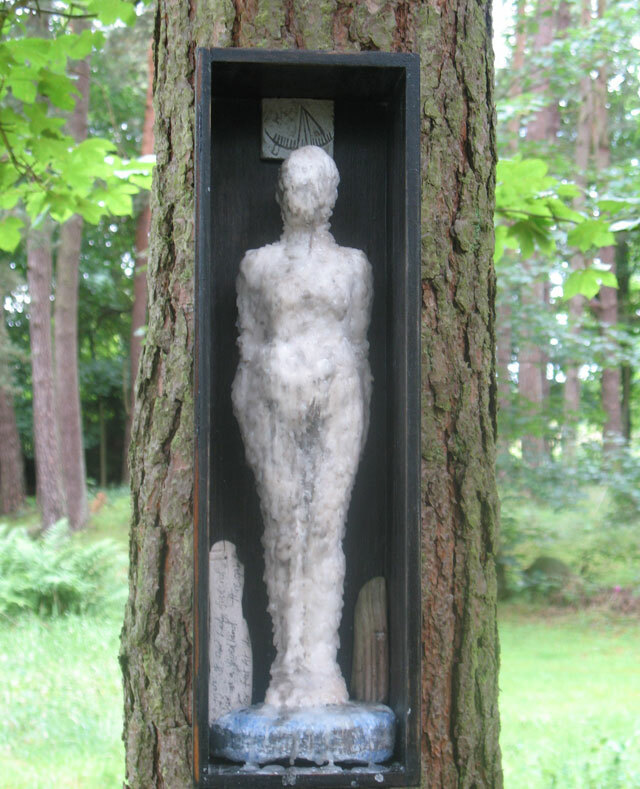 Awakening awareness and recognition of instinctual and cultural traditions, ‘Shrine’ encourages consideration of the common place and familiar aspects of our natural surroundings.The figure created from clay and covered in wax, is set inside a dark wooden box and surrounded by manufactured and found objects, placed to resemble tokens offered by nameless pilgrims. The work allows space for quiet contemplation and reflection provoking the imagination to make of it what it will. Underpinning the work are questions aimed to challenge and investigate religious systems both independently and as part of a common human experience. Frances Law graduated in drawing and painting from Glasgow School of Art in 1980. She is a painter and mixed media artist who regularly exhibits in Scotland and abroad. She was recently shorlisted for the Aspect Prize and is currently working towards an exhibition in the Fleming Gallery in London. Bending moment is an engineering term to describe the limit of flexibility, the extreme edge of equilibrium – a point at which balance ends and collapse is possible. In this piece Shona uses the term to describe the way our actions and inactions directly influence our personal equilibrium. Personal bending moments live on the edge of the possible – defined by moral, spiritual, emotional and physical variables. The work explores our place within the natural cycles of growth and decline and the way in which our balance is challenged by forces – external and internal alike. Reality is a balance swayed by our perceptions. It is the way we think about events, rather than the events themselves, that ultimately dictates our path. Shona Leitch works from her studio in Perthshire creating flowing sculptural forms and, more recently, figurative work. She graduated from Grays School of Art in Aberdeen in 1991 and has exhibited internationally. As well as creating her own work she also runs regular classes and workshops. Throughout our lives we collect personal objects, some we cherish and guard even if they are broken or obsolete. We may not use them in our daily lives, but we continue to find space for them. To discard or lose these objects would feel like part of our history and sense of self was being lost. This installation reflects this relationship we have with our possessions.True to life the persona that we project is often ambiguous, are these objects also ambiguous. How much is real and how much imagined! Juxtaposed between the boxes the mirrored figures are the vestiges of the imagined individuals. They will be there, but disconnected from their possessions. Asking the question of who we are once stripped of our material property. Each box holds references to their past and present lives. 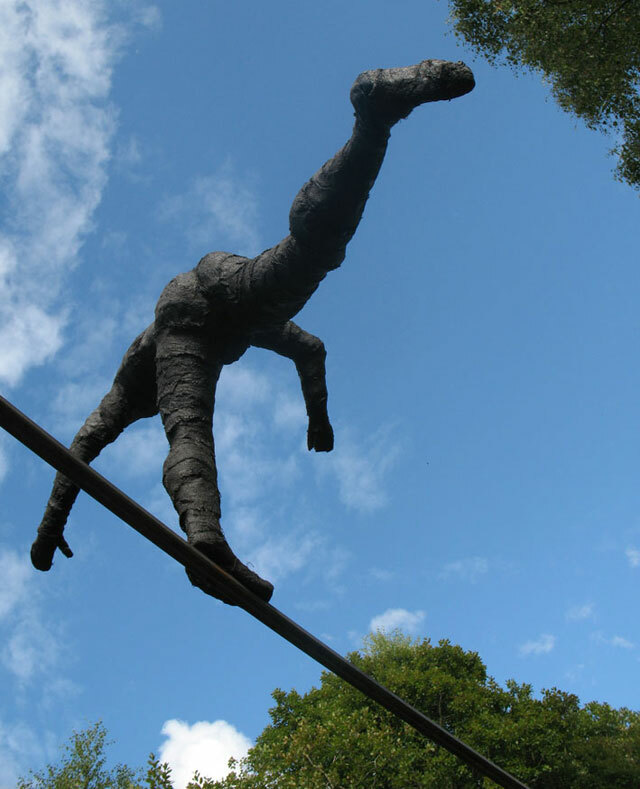 He recently completed a major public art commission as part of the ‘ Imagine Alloa’ regeneration project. He exhibits his work nationally and participated in this year’s Glasgow International Arts Festival. Recent awards from the Scottish Arts Council have assisted in developing his artistic practise.Rob Mulholland graduated in Sculpture from Edinburgh College of Art in 1986.
www.heartwoodartists.blogspot.com where visitors can also leave their comments. Martine Foltier Pugh graduated with BA Hons Sculpture at Edinburgh College of Art in 2006. She went on to do an MA in Contemporary Art Theory and is currently researching for an MPhil in Visual Culture. 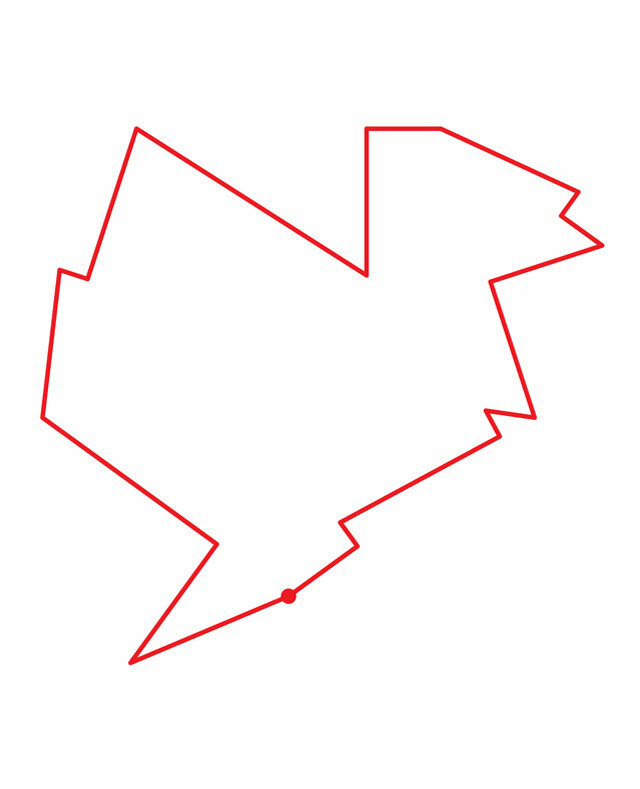 2.Walk in a straight line from your first fixed point towards the next one, and continue like this until you’ve ended up in the point where you started. 3.Whenever you encounter a hindrance of some sort – a large rock, a tree, or whatever else that forces you to walk in anything other than a straight line – throw a pair of dice. The first one tells you what direction to take: odds left, evens right. The number of the second die multiplied by ten is the number of steps you should walk in the given direction. If you encounter a new hindrance, or when you have walked the necessary number of steps, turn to walk straight towards the next point of your pentagon. Whenever you find your path is blocked, throw your dice and repeat the procedure. Svop/t is composed of two Norwegian artists and an Italian architect. Together they work on projects that combine their interests in art, design, architecture, site specific work and spatial relations and interventions.